Highly recommended! The Swarovski Silver Crystal Book and Beyond Silver Crystal Book have pictures and Swarovski Value (insurance replacement values). 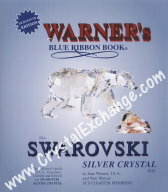 Inventory your Swarovski collection and learn more using these Swarovski books / price guides / catalogs. They also sell Swarovski paperweights in various colors. More information about these Swarovski Books is available on our site. Swarovski Silver Crystal and Swarovski Beyond Silver Crystal Books are available for viewing on the internet. Various subscriptions available. View color images and more here. The only one of its kind on the internet!!! Learn more about this Swarovski service is available on our site.